Hoop Nut #PBA2016 2016 PBA Commissioner's Cup Alaska Aces Meralco Bolts PBA PBA Preview #PBA2016 COMMISH CUP PLAYOFFS PREVIEW: MERALCO BOLTS vs ALASKA ACES - HUSTLE & MUSCLE! 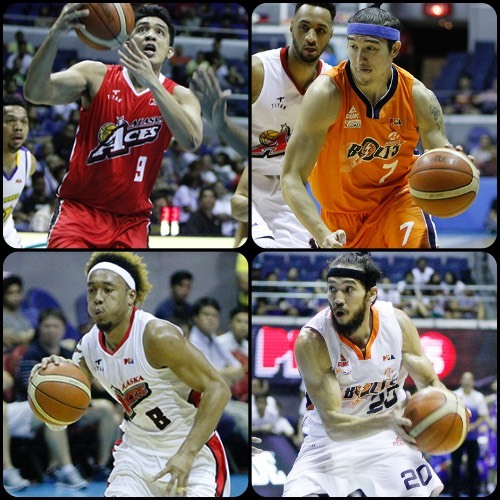 #PBA2016 COMMISH CUP PLAYOFFS PREVIEW: MERALCO BOLTS vs ALASKA ACES - HUSTLE & MUSCLE! - This will be a very interesting series. It pits the team that topped the elims of the 2015-2016 PHL Cup with a 9-2 record (ALA) and the team that finished at the very bottom with a 1-10 slate (MER). In this conference, though, both teams have enjoyed a good measure of success. MER finished as the second seed overall with an 8-3 record, while the Aces were just one spot lower at 7-4. MER also beat ALA earlier this conference, 107-101. Both clubs also have some very energetic and athletic players who will help define this series as one of hustle and muscle! - MER needed just one game to dispose of sister team NLEX in the quarterfinals, 104-97. The Bolts survived a huge 38-pt outburst by Al Thornton to prevail thanks to their staring unit playing well and reserve big man Reynel Hugnatan stepping up with 20 points. Arinze Onuaku was relatively quiet on offense in that game, and that’s because he was in foul trouble. That’s certainly something the Aces will try to do here to minimize the impact of the big man. Veterans Cliff Hodge and Jared Dillinger rose to the occasion, though, combining for 37 points, and coach Norman Black will really need more of that as the Aces will probably make life extra tough for Onuaku. If rookie Chris Newsome along with other guys like Baser Amer and Dillinger can provide the hustle for the Bolts, their teammates like Onuaku, Hodge, and Hugnatan should be able to provide the muscle. - As for ALA, the Aces roared back from a 0-1 series deficit to defeat and dethrone defending champion Tropang TNT. Rob Dozier and Calvin Abueva teamed up to record 38 points for the victorious Aces in Game 3, and they also got a ton of help from the likes of Eric Menk, Ping Exciminiano, and Tony dela Cruz. Coach Alex Compton will need more of that well-spread production for them to be able to get past a well-balanced MER squad in this series. ALA should expect that the Bolts will thrown everything including the kitchen sink to be able to make their first ever Finals appearance in the PBA, and it will take a lot of hustle from Calvin Abueva and RJ Jazul and muscle from Rob Dozier and, if possible, Vic “Muscle Man” Manuel to be able to move on to the next round. - For most of this conference, Onuaku has been a dominant force for MER, but he seems to have slowed down in their last 2 games. He has also gotten himself into foul trouble, so that’s something he has to check lest it be exploited by the Aces. - Seeing Cliff Hodge go up against Calvin Abueva is never a boring thing, and we’ll be treated to as many as five games here in this series! Hodge will have to raise his game higher, though, since Abueva is expected to really put up big numbers, and the Fil-Am will have to bounce back since he struggled in their last game against ALA.
- MER isn’t exactly the best playmaking team in the league, but in their last game against ALA, ball movement was one of their main weapons. With PGs like Baser Amer and Jimmy Alapag, and with JV Casio missing from ALA, the Bolts should be able to move the ball well. If they can do that, they should have the edge against the Aces. - Calvin Abueva remains among the best local players in the PBA, and he showed that in ALA’s last 2 wins over TNT. Without a doubt, he’s ready to pounce again here even against the higher-seeded Bolts. His impending match-ups with the likes of Cliff Hodge, Jared Dillinger, and Chris Newsome should prove to be very exciting for the fans. Needless to say, if Abueva is allowed to take over, MER will be in big trouble. - With JV Casio still a big question mark, the onus will be on RJ Jazul to step up at the PG spot for the Aces. He will have to contend with youngster Baser Amer and veteran Jimmy Alapag, and he will have to prove himself through playmaking and perimeter shooting. If Jazul can prove to be effective, that’ll be another big weapon coach Alex can utilize in this series. Last game vs MER: 12pts, 3rebs, 2asts, 1stl, 2 triples. 6. ALA: RUN DEVIL RUN! - Despite losing to MER in their last game against each other, one thing that worked for ALA was scoring in transition. With high energy and speedy guys like Abueva, Jazul, Chris Banchero, Cyrus Baguio, and Ping Exciminiano, the Aces should utilize that weapon and get out in transition as much as they can. This is especially true against the Bolts, who are among the worst teams in terms of transition defense. - It wasn’t so long ago when Abueva, as a rookie, matched up with some of the league’s best wingmen. Not the shoe is on the other foot as Abueva will be squaring off against rookie sensation Chris Newsome. At his best, Newsome is as energetic, athletic, and relentless as Abueva, so this should be a very exciting match-up to watch. If Newsome is able to limit Abueva’s production, MER should be in good shape.